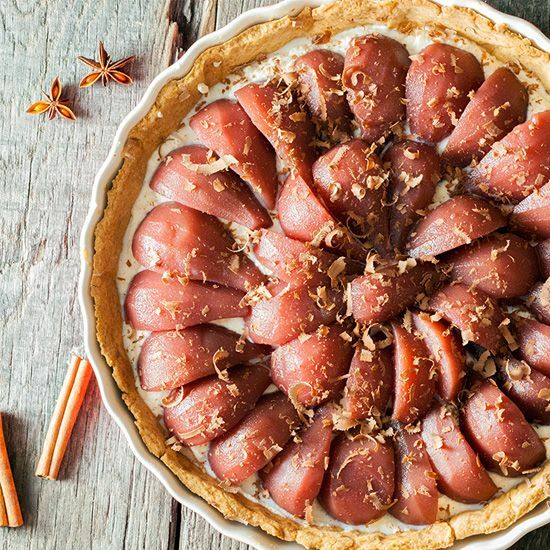 Poached pear and cinnamon pie is filled with flavors that suit autumn perfectly. Very easy homemade pie crust and whipped cream, topped off with chocolate. Start preparing the pie crust. COMBINE the flour, 1/2 teaspoon of cinnamon, salt, 1/2 teaspoon star anise or cardamom and 80 grams of sugar. CUT the cold butter into cubes and add it one by one to the flour mix. The dough will look crumbled. ADD 1 egg and keep on kneading until a dough ball forms. WRAP the dough in cling film and place in the refrigerator for about an hour. COAT the pie form with butter using the silicone kitchen brush. PRE-HEAT the oven to 190 degrees celsius or 375 degrees fahrenheit. DUST the work surface with flour and roll out the dough using the rolling-pin. TRANSFER the dough to the pie form and evenly divide the dough into the form. The dough is very soft, so it’s possible it will break during the transfer. That’s okay, just press it with your fingers into the form. PLACE a piece of parchment paper on top of the pie crust and fill it with blind baking beans. BAKE the pie crust in the oven for about 10 minutes. REMOVE the blind baking beans and parchment paper en bake the pie crust about 5 minutes more, until beautifully golden brown. Let it cool off completely. WHIP up the heavy cream with about a tablespoon of sugar and about 1/2 a teaspoon of ground cinnamon. DIVIDE the whipped cinnamon cream over the pie crust. 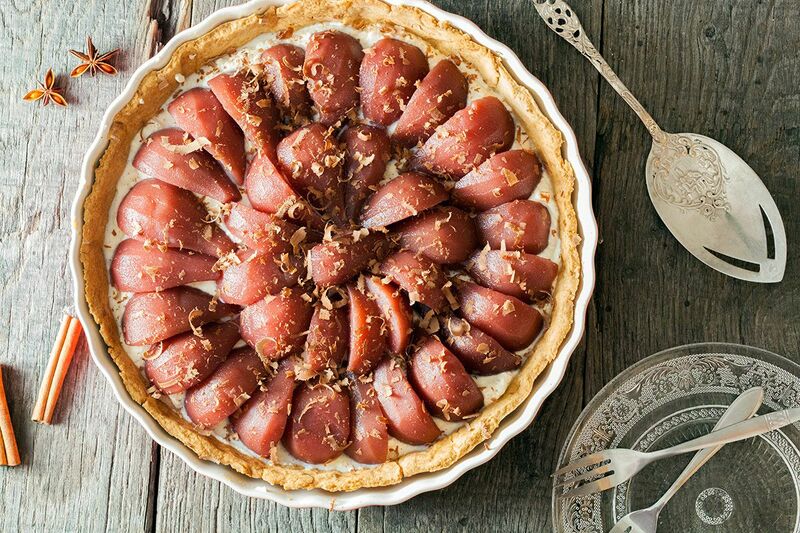 DIVIDE the poached pears into quarters and divide them over the whipped cream. 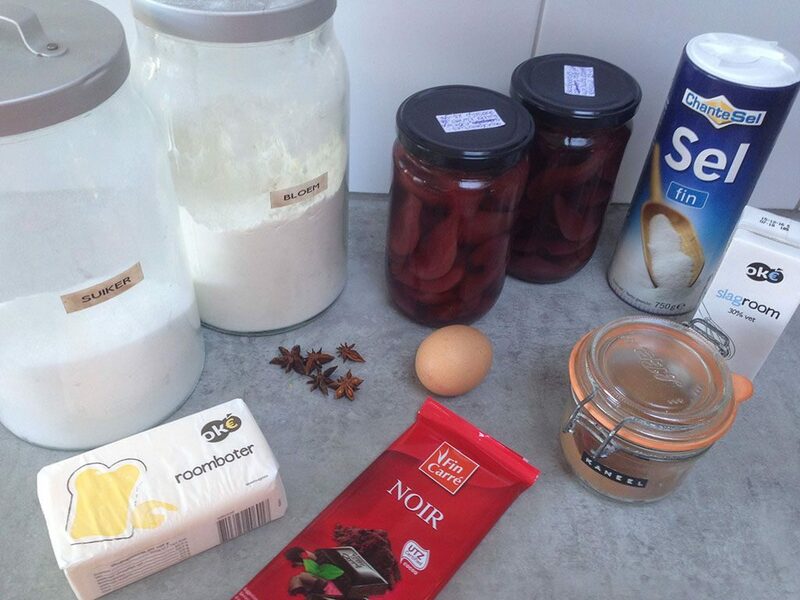 Finish the pie with dark chocolate shavings, serve immediately and enjoy!